Learn how to create and configure an Authentication policy, which dictates the identity and domain/realm to use when authenticating the message sender. The Authentication policy allows you to protect your services by applying authentication to messages and by making sure that the messages come from trusted domains. In order to protect services from unauthorized parties, the initiators of a web service message exchange must be identified. WS-Security specifies mechanisms for representing identities in a message exchange; however, it only addresses how the messages themselves can be tied to an identity. For services that require the caller to be known, authentication of the identity associated with request messages must be performed. Identities are tied to trust domains or security realms. A service might support identities in multiple security realms. Identification of the requirement for authentication and which security realm, or domain, must be used for authentication is configured through an authentication policy. At this point, you've created the policy, but it doesn't do anything. The next step is to configure the policy details. See Configuring an Authentication Policy below. In the center pane, in the Authentication Policy section, click Modify. 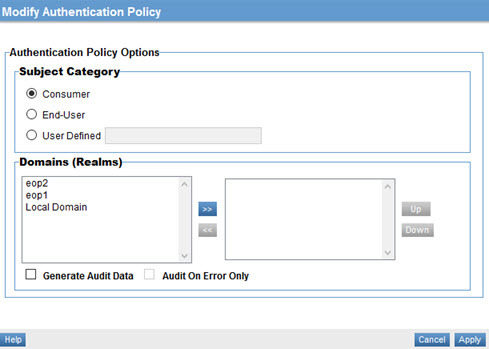 The Modify Authentication Policy overlay is displayed, as shown below. Specify values for the subject category and domains that the policy will apply to, and the audit options. For details on field values, see Authentication Policy Options below. The Authentication policy includes the options listed below. Consumer (the default): Authenticates the consumer identity sent with a request message. User Defined: If you choose User Defined, specify a custom category name; for example, a platform identity. Specify one or more realms to which authentication will be applied. Valid realms are displayed on the left. Highlight a realm and then click >> to choose to authenticate messages using that realm. You can choose one or more. You can also arrange the realms you've selected in order of priority. Generate Audit Data: Enables the audit feature. By default, this captures all message data, whether success or failure, for all message exchanges. On Error Only: If you choose to generate audit data, you can specify that audit data is captured only when an error occurs on a message exchange. This required attribute identifies the specific identity associated with the message to authenticate by category. The SubjectCategory is specified as a URI and must correspond to a SubjectCategory specified in the security policy governing the same message. URI representing the trust realm, or domain, in which the authentication is performed. Additional attributes MAY be specified but MUST NOT contradict the semantics of the [owner element]; if an attribute is not recognized, it SHOULD be ignored. This is an extensibility mechanism to allow additional elements to be specified. On line 02, the SubjectCategory attribute indicates that this policy is for authenticating consumers. Lines 03 and 04 identify two realms that the consumer identities could be a part of, example.com and bankingfederation.org. It is assumed that the container has the ability to authenticate users in those realms, either directly or indirectly. An authentication policy does not dictate any behavior required by a consumer in order to complete message exchanges. Therefore, it is recommended that authentication policies be classified as private by including the ganp:Visibility attribute in the enclosing the wsp:Policy element with a value of "private". The following is an example of an authentication policy attached to WSDL components. Lines 02 – 11 are two authentication policies, Auth1 and Auth2. Auth1 is associated with the GetQuote operation on line 17. Auth2 is associated with the GetSymbol operation on line 22.